Do you have a garden? Do you like it? Someday, I would love to have a really big garden and raise a lot of food for me and Kyle to eat. I read all these memoirs about people becoming farmers, or feeding themselves from their backyard vegetable garden, or raising chickens for their eggs and rabbits to slaughter and eat. 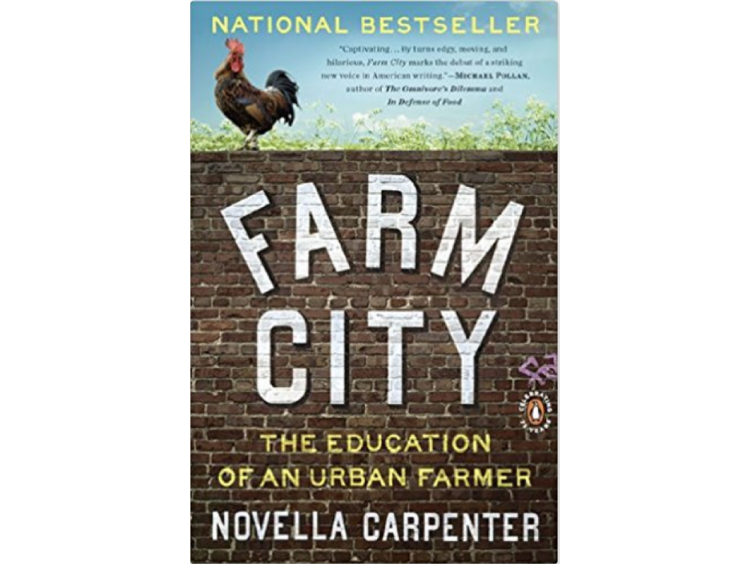 The most recent one I’ve read is Farm City: the Education of an Urban Farmer, by Novella Carpenter. In the mid-2000 she and her boyfriend moved into a rough part of Oakland, California, and she raised fruit and vegetables and animals in the vacant lot next door. And I really want to have a garden like that. I like eating really fresh produce. If I come across a plum tree, for example, or an apple tree, or some kind of tree that’s full of fruit and I think it’s okay for me to pick that fruit, I’ll do it. And that fresh fruit is so delicious! For a few years I’ve been trying to grow things in pots on our balconies. But my tomatoes never bear much, the raspberry canes put out a few small raspberries and then turn brown and die off, and the pea pods develop a white dusting of something on them and then they upset my stomach if I eat them. Although, now that I think about it, I grew lettuce for a year or two, and that did really well. Maybe, if I ever really had a big garden, I wouldn’t like it. It might be a lot of work for not a lot of reward. Those of you who have gardens, is the work worth it? And while I know that I love fresh fruit and vegetables, my in-laws grew up raising most of their own food, but now they’re perfectly happy to buy their food from a grocery store. My father-in-law did have a garden for many years, but at some point deer and woodchucks and gophers ended up eating most of what he tried to grow, so he gave up. I do miss having a yard to putter around in. Kyle doesn’t, though. When he and Rod, his brother, were growing up, their dad rousted them out of bed by 9:00 of a Saturday morning and set them to mowing their yard. With a push mower. It was a huge yard. So big that when Rod and then Kyle moved away to go to college, their dad bought a riding mower. Working in a garden is a nice mindless activity. I used to like working on my car when I was in grad school for the same reason. Well, one reason was because I was poor, and I saved money by working on my own car. But the other reason was that working on a car is restful and physical and not cerebral at all. Every so often, I’ve toyed with the idea of asking the condo board if I could put in some planters on the roof and grow things up there. But I never have. I’d have to haul everything up the last flight of stairs to the roof, and by everything I mean the planters, the soil, and lots of lots of water. Maybe part of the reason I’m thinking about how I really want a garden is because the weather is gorgeous as I write this. It’s been gorgeous for several weeks. I can imagine peas and tomatoes and carrots and beans and blueberries and strawberries growing really well in this sunny weather. And tasting delicious. For now, I guess I’ll just read memoirs about people with gardens. And drool over all the good food they have to eat. And if you have a garden and you want someone to work in it… I’d do it in exchange for some of what you grow.